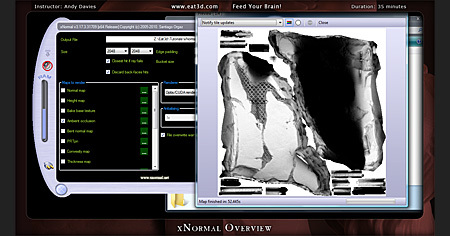 He provides an overview of the different settings you are most likely to need, such as adjusting the amount of decimation and masking to get the most out of your decimated meshes, and explains the differences between the options within the plugin, to ensure maximum compatibility for application specific configurations while maintaining a good workflow. 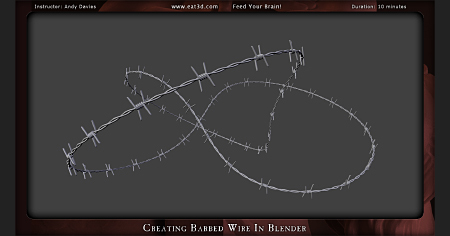 In this demonstration, Andy Davies goes over the creation of barbed wire within Blender. He shows the techniques needed to efficiently create realistic barbed wire and how to control its total length and shape by using a curve, which allows it to be changed on the fly while still retaining a large amount of control. 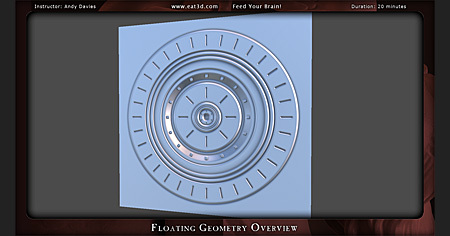 In this demonstration, Andy Davies gives a overview of Floating Geometry baking techniques using Blender and nDO2. He shows the techniques needed to efficiently use floating geometry to bake high poly details into Normal maps, without the need for complex topology. He then goes through the process of creating an Ambient Occlusion map using nDo2 before using the maps within Marmoset Toolbag for the final result. 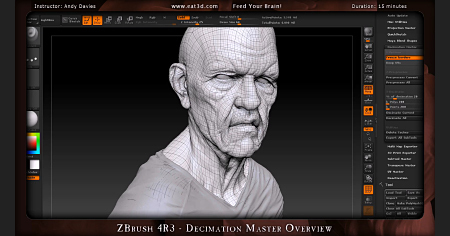 In this demonstration, Andy Davies goes over the creation of tileable textures within Zbrush 4. 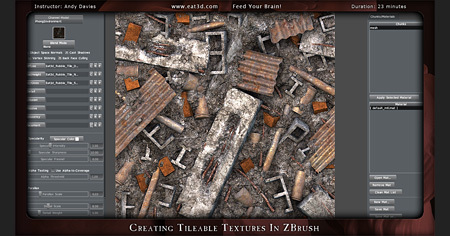 He shows the techniques needed to efficiently create a realistic rubble pile by making a tileable ground mesh using Displacment maps and placing premade Polypainted assets whilst offsetting the canvas. He then shows how to create and export the Diffuse, Displacement, Normal and Ambient Occlusion maps from within Zbrush, along with the final tileable rubble mesh for use within xNormal for an additional Ambient Occlusion bake and any other textures that may be required. In this demonstration, Andy Davies goes over some of the most widely-used features within xNormal and shows how to bake Normal, Ambient Occlusion and Polypaint textures, along with showing multiple methods of setting up a cage within the application. He also provides an overview of the different settings you are most likely to need, to get the most out of your bakes, and explains the differences between the options within the various map types, to ensure maximum compatibility for engine specific configurations while maintaining a good workflow. 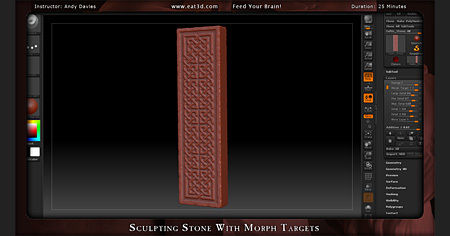 In this demonstration Andy Davies shows how he sculpts stone details in ZBrush using morph targets. 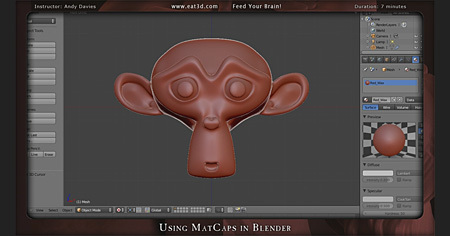 In this demonstration Andy Davies shows you how to bring your ZBrush MatCaps into Blender. 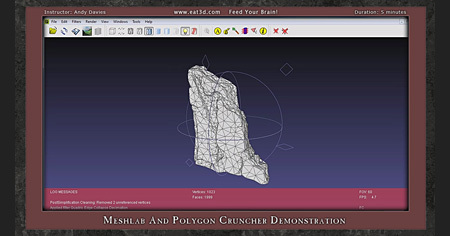 In this demonstration we go through optimizing a mesh using Meshlab and Polygon Cruncher standalone. Then the meshes are exported through Blender to toggle the 2 meshes with 3D Photo Browser.